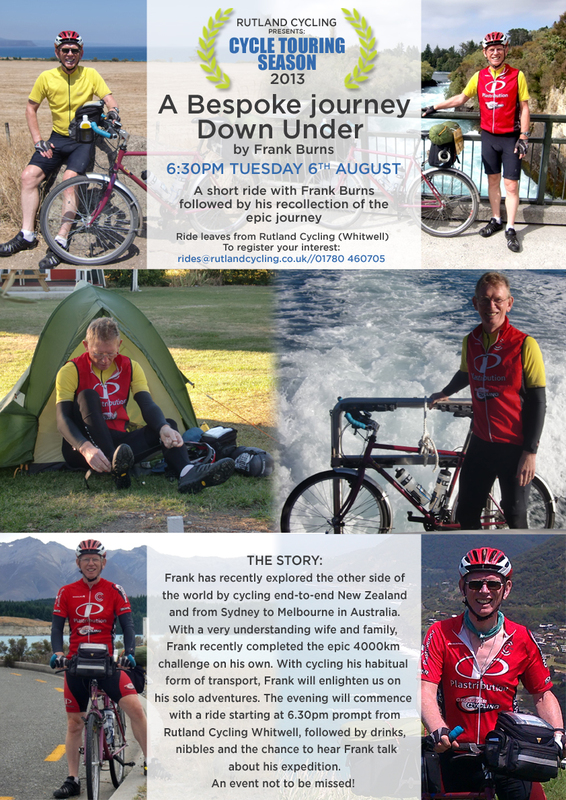 Posted on August 3, 2013, in New Zealand End-to-End 3000kms and tagged cycling, exercise, sport, touring, travel. Bookmark the permalink. 4 Comments. I’d love to come, Frank, but it’s too far. Can you please let me know if you do any local talks again? Really enjoyed the presentation, very entertaining and equally inspiring. Now planning my first cycle/camp to the East coast one weekend in September. I ,also, would like to know if you are planning another talk as my wife was unable to attend the other evening. Thanks for those kind words Pete, and so glad you could be there. Most of my presentations are done to closed groups (Rotary etc…), but I will be doing one in the autumn for Kettering CTC, date and place to be confirmed. I will try to remember to email you and alert you of that.